Japanese agriculture is facing problems of the rapid decline and aging of the farming population, and the plant factory is expected to bring about a structural change in this situation. 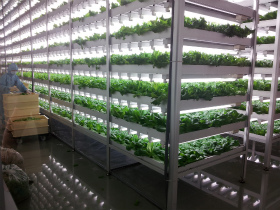 The plant factory produces vegetables and other products in a computer-controlled environment, including temperature, light, water, nutrients, and carbon dioxide. 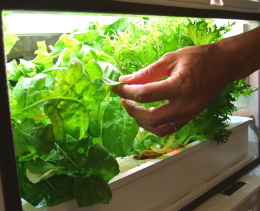 It will be able to achieve a stable supply of greengroceries both in quality and quantity, by maintaining the best growing environment for the plant through minimizing the environmental risks such as the climate, disease and insect pests. It will also provide farmers with comfortable working conditions. Particularly after the nuclear disaster last year, there have been high expectations of the plant factory because of the increasing consumer demand for safe food. It is also hoped to be useful for the reconstruction of disaster-hit areas which are still suffering from salt damage caused by the tsunami and radioactive contamination. Plant factories are also attracting attention from overseas as climate change and other factors are intensifying the world’s food problem. In Kashiwa City, Chiba Prefecture, a project has started up, aiming at becoming a global center of the development of the plant factory. “Kashiwa-no-ha Smart City” is a futuristic urban development project which aims at becoming a model for resolving global issues such as environment and energy, and aging population. Chiba University Plant Factory started operation in this area in April last year. Seven consortia have established their own factories, and are carrying out forefront research for gaining maximum yield with minimum resources and energy, ultimately making plant factories friendly for people and the environment. Assuming that more elderly people will go farming in the future, the test operation of a robot assistant will start this month in one of the factories. Another pilot project has also started to introduce a family-use miniature plant factory. The tour will visit Kashiwa-no-ha Smart City and cover the latest developments of plant factories. *Chiba Prefecture hosts this tour and FPCJ cooperates with the planning and conducting. Tour participants bear part of the cost, but the purpose of the tour is not profit-making. Kashiwa-no-ha Campus area, in the northern part of Kashiwa City, Chiba Prefecture, is located 25km from the center of Tokyo, only 30 minutes by Tsukuba Express train. The development of this area, formerly used mainly as a golf course, started about 10 years ago as city planning from scratch. 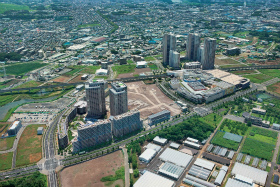 The University of Tokyo and Chiba University have already opened campuses just outside this vast development area (273ha), which is expected to become an international campus town with a large housing complex, commercial facilities, and 26,000 residents. The goal of this project is to make a model city to resolve global issues with “life in harmony with nature,” ”health and longevity,” “creation of new industry.” It is also trying to create a safe, secure, and sustainable smart city. For example, 400 households are already equipped with a home energy management system (HEMS), the largest of its kind in a single community in Japan. A multi-vehicle sharing system also started in June last year, in which people share electric cars, electric motorbikes, and bicycles. Also drawing people’s attention is a “smart city with agriculture” project, which proposes a new urban lifestyle combined with agriculture. 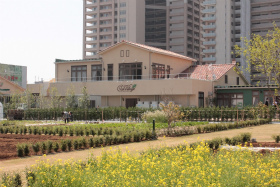 In front of Kashiwa-no-ha Campus station, you can see a 10,000㎡ rental farm where local people can enjoy farming, as well as having a barbeque with fresh vegetables, and even a wedding, at the farm. Officially opened in June 2011 as a project subsidized by the Ministry of Agriculture, Forestry, and Fisheries, Chiba University Plant Factory is Japan’s largest plant factory research facility. Seven consortia, made up of private companies and organizations, and educational and research institutions, have established five tomato factories using sunlight and two lettuce factories using artificial light. With their own production technology, they are competing in enhancing productivity and cutting down the production cost. 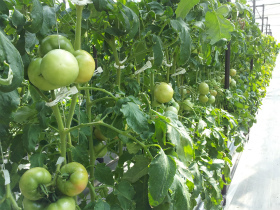 Tomato production has already reached the top level in Asia. As for lettuce, it has been proved that the plant factory is resource-saving and environmentally friendly since, compared with farming in a field, they use only 1% water and 25% fertilizer, while the yield is as much as 50 times. The cutting-edge technology of Mirai, Inc., a venture company which is operating a plant factory here using artificial light, is attracting wide attention in the areas damaged by the Great East Japan Earthquake. The plant factory is expected to produce safe and secure food in farms damaged by the tsunami, and to lead to the reconstruction of the areas through the development of a new industry and job creation. In Tagajo City, Miyagi Prefecture, a plant factory using Mirai’s technology will start operation next fiscal year. Also in Kawauchi Village in Fukushima Prefecture, another factory using artificial light will be established this year by another company, and Chiba University will train those who will be working in these plant factories. Since the food problem is a global issue, the plant factory is attracting not only domestic but also world attention with its capability of stable production with minimum resources, regardless of climate and weather. They have accepted over 7,000 visitors since their opening over a year ago, several hundred of whom were from overseas, mainly from Asia. As another piece of advanced research, a test operation of a tomato-carrying work assistant robot started this month in a tomato factory. 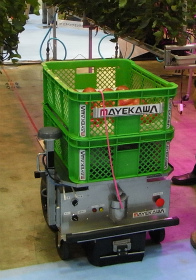 This cart-type robot, which moves with a human worker and conveys the harvested tomatoes to the consolidating point, is expected to provide further efficiency and a reduction of the human workload. At the Chiba University Plant Factory, Dr. Toru Maruo, Associate Professor, Faculty of Horticulture, Chiba University, a leader of this project, will give a briefing on the potentials of the plant factory, and show you the plant factories, including the one with a robot in test operation. As another innovative project in the field of plant factories, a network-type home use plant factory has been experimentally introduced in monitor families from September this year. This is part of the project initiated by the “Plant Factory Everywhere in Town Consortium,” which is organized by Chiba University, Mitsui Fudosan, Panasonic, and Mirai. 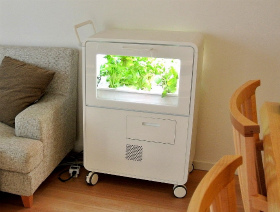 Monitor families produce vegetables using a home use plant factory, which is as small as a mini refrigerator. Its fashionable design is quite popular among monitor families, who say that it looks like a combination of indirect lighting and a foliage plant. This is an unprecedented project, in which they study how the temperature and humidity of each household will affect the vegetable growth. The monitor families will be able to get some advice from the specialists through a website for their exclusive use. They are also thinking of creating a new community by networking the monitor families, enabling them to exchange information, and even the vegetables they produce, with other families. The tour will visit a monitor family and hear how they are growing vegetables at home and communicating with other monitor families. * FPCJ will later inform the participants of payment methods, cancellation fee etc. 4. Participants: Limited to the first 10 applicants. (2) Chiba Prefecture and FPCJ will not be liable for any inconvenience, trouble or accident that might occur in the course of the tour.